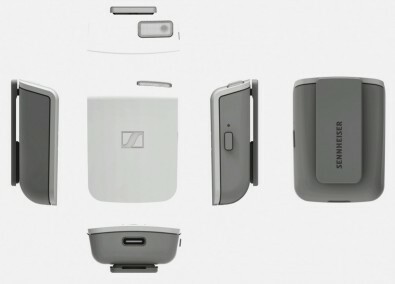 Sennheiser will introduce the Memory Mic for smartphones, a broadcast-quality wireless microphone for mobile journalists. Sennheiser said the size and quantity of equipment that journalists and reporters require to create professional quality content has decreased considerably. With the Memory Mic, the company is tackling the problem of microphones that fail to satisfy professional broadcast requirements. The small, lightweight wireless microphone not only offers broadcast-quality sound but also works at any distance from the smartphone. The mic and the accompanying app for Android and Apple are available now. For a report, commentary or documentary, the Sennheiser Memory Mic is synchronized with the smartphone app and attached to clothing via the magnetic clip. The one-ounce microphone replaces much heavier equipment while still allowing the journalist to deliver excellent audio quality. When recording with the Memory Mic, the integrated microphone of the smartphone is also active and works to concurrently pick up ambient sound. Using the dedicated audio mixer of the Memory Mic App, the user is able to select the optimum balance between ambience and the audio captured with the Memory Mic at a later point in time. The audio mixer within the Memory Mic App lets users select any ratio between the audio captured with the Memory Mic and ambient sound. As the wireless Memory Mic does not occupy any input on the smartphone, journalists can still employ additional accessories such as a gimbal or connect an additional wired microphone for interviews. The Memory Mic features a high-quality Sennheiser condenser capsule with omni-directional pick-up pattern. The mic is resistant to wind noise and forgiving if a speaker changes the angle and/or distance at which he or she is talking into the microphone. Via the app, the sensitivity of the microphone can be set at three levels in order to adapt to louder or softer voices. The operating time of the microphone is up to four hours – a full recharge of the integrated lithium-polymer battery via the USB port takes two hours at most. Within an hour, the battery has recharged to about 70 percent of its full capacity. The Memory Mic is available now and comes complete with a USB charging cable and a quick guide. The free Sennheiser app is available in the Apple App Store or from Google Play.